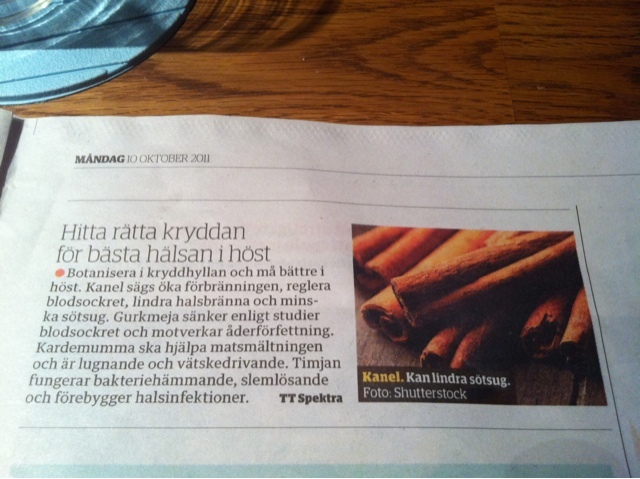 Found this small notice about spices' health benefits in the free newspaper on the bus. Apparently cinnamon will help on burning calories, regulate your blood sugar, lessen heartburn and sugar cravings. I also read somewhere else that cinnamon helps for menstrual pains and at least it works for me. I just add some in my hot chocolate for example and no need to take pain killers (which I try to avoid as much as possible). Turmeric (gurkmeja in Swedish) is according to the notice good for lowering blood sugar and against arteriosclerosis. Cardamom again will help the metabolism and have a calming and diuretic effect. Thyme will work against bacteria, expectoration and will prevent throat infections. Learned a few new medical terms in English translating that but I found these sort of things interesting. Enjoy a spicy autumn!